D2 vs. 1095 steel: Which one is the better material for your blade? When it comes to a knife, the steel of its blade can be a rather influential factor in the knife effectiveness. There is a wide range of material available on the market with different characteristics and it can be hard to make a decision right away. If this is what you are going through then this article can introduce you to two excellent examples: D2 and 1095. They are great material from AISI and possess admirable performance. Down below is a review of them which provide you with additional information on their composition and features. D2 vs. 1095, what you should go after? It’s easy to answer this question if you know the knife purpose and the conditions you use it in. Everything got its pros and cons, the same logic can be applied right here. Crosscheck the steels with your needs and requirements then you can come up with a wise decision. As long as it fit your preferences and the environments, your choice of blade material will not disappoint you. Now, let’s take a closer look at the steels and see what they got to offer. D2 appeared for the first time back in WW2 and until this very day, it remains popular with knife maker all around the world. Its corrosions and rust resistances are fairly decent though it’s not technically a stainless steel. With approximately 12 % of Chromium, D2 fall short of the usual 14% requirement to be called such. The presence of Carbon ensures that D2 toughness is respectable though not exactly the best. It tends to chip out therefore more suitable for compact knifes and alike. For large size fixed blades such as choppers and survival knife, D2 is probably inadequate for the job. The edge retention rate is great yet it can be hard to sharpen if you have to. As a high carbon steel, 1095 is normally utilized by heavy duty knifes. Its composition means regular maintenance is required because a 1095 blade is vulnerable to rust and stain. Many models and products coat that uses 1095 apply a layer of coating to fix these issues. With the high endurance, chipping resistant, hold the edge well and easy to sharpen, 1095 is a good choice for choppers and survival knife. As long as you can keep it clean, a knife with the 1095 blade will serve you well due to its durability and reliability. Applying a thin layer of lubricant or oil before storage and frequent cleaning are good ideas to deal with the 1095 drawback. 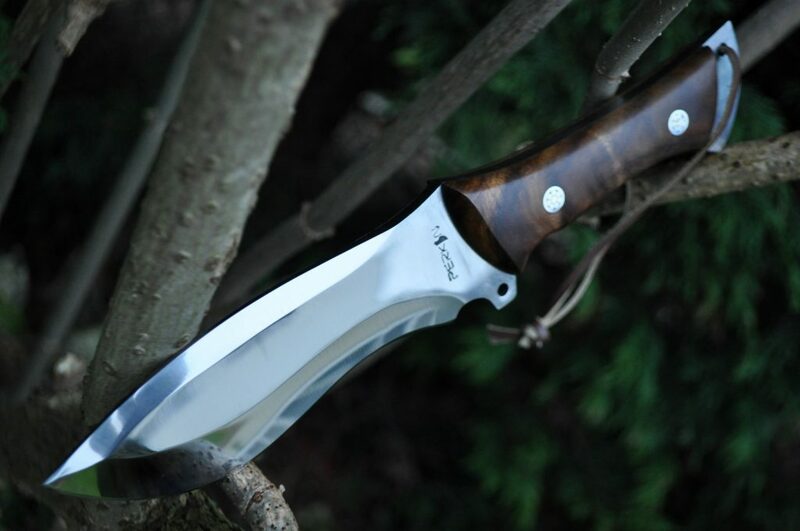 If you prefer a tough and dependable blade for your knife, you can’t go wrong with 1095 steel. It’s only major shortcoming is that 1095 steel tends to rust and stain. But with proper maintenance and use, this issue can be minimized. With the additional coating which is usually applied, the issue can be reduced even further. When strength and toughness are the priorities, a 1095 blade is an excellent candidate. It should perform well in the average working conditions. Provide that you wield and store it correctly, 1095 blade can be extremely effective. The one thing that you need to keep in your mind here is that there is hardly anything which can satisfy everyone. Take into account your own personal situation instead of depending on others. You are buying something for your use so take some time to think before deciding on a purchase. A diversity of user demands and requirements means many people might feel one is superior while the rest think differently. It’s best that you ensure what you are going to buy have actual benefits in order to be called a wise investment. As with any purchase, you want to own a knife which is usable and practical. That is why you must take some time to think and consider whether a particular steel is good enough or not. To come up with a logical choice, ask yourself how you are going to use the knife? What kind of task do you expect your knife to perform? How much are you willing to spend on a knife? It’s essential that you answer these questions beforehand so you can grab the most suitable product. Take advantage of the information above and you can make the right decision. And that is enough to cover the basics, quite easy to understand, right? D2 vs. 1095, it’s difficult to determine a winner if you don’t know a lot about them. With this article, now you know the characteristic the steels and can come up with a logical and informed conclusion.